Orlias canyon – Mt. Olympus. Orlias canyon lays on the northeast slopes of Mt. Olympus near the well known archeological site and the village of Dion. 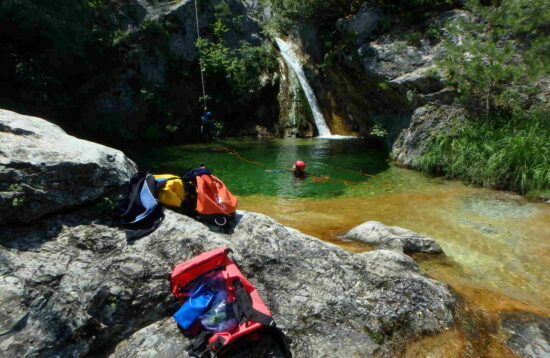 Because of the fact that it is relatively long with numerous and high waterfalls, we split it in two main sections Orlias I and II, so that the participants can enjoy it the most as a one day activity. A smaller last section is Orlias III, ideal for families with smaller children and large groups of absolute beginners. Enipeas canyon – Mt. Olympus. Enipeas is a long stream running along the eastern slopes of Mt. Olympus, its springs being at about 1200m at Prionia location and meet Litohoro at the mountain’s feet and subsequently the Aegean sea after some 11km downhill run. In the millions of years it has created the dramatically beautiful Enipeas or Mavrolongos gorge, one of the most beautiful landmarks of Mt. Olympus massif. 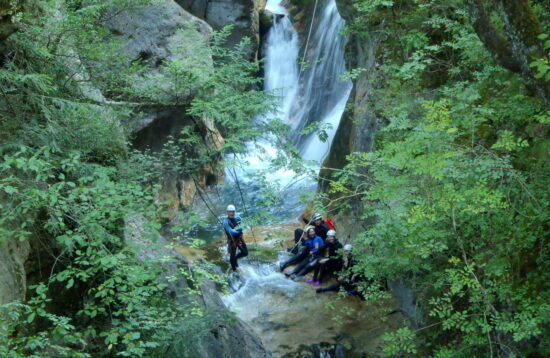 The canyoning section of Enipeas starts at the height of S. Dyonisios monastery (840m), and finishes at Litohoro at about 300m. Because of its great length (about 6km) and long crossing time, especially when we talk about relatively large groups of people, we do it as an organized outdoor activity in three separate sections, Enipeas I, II and III. By doing so, we aim to the full enjoyment of the participants within normal timing and physical fatigue. Agia Kori canyon – Mt. Olympus. Another miracle of the Olympus nature. It flows parallel to Orlias to the west, not far from it. 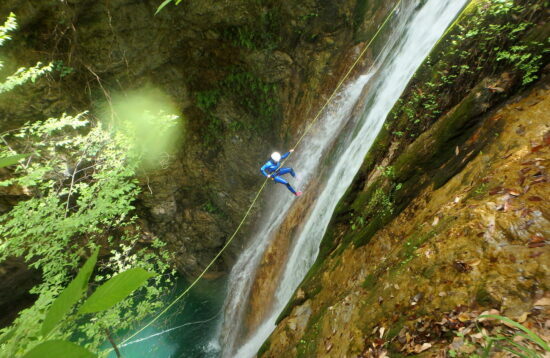 A very characteristic element / atraction of this canyon is its exeptionally crystal-clear waters and green / blue pools! 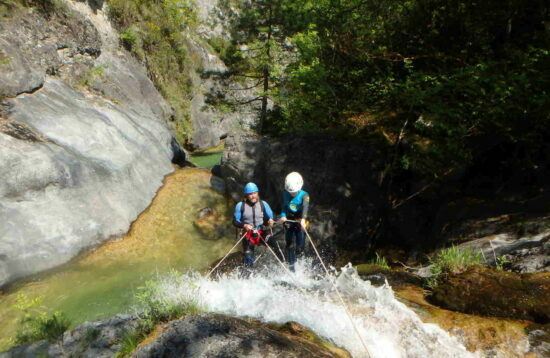 Its second section, the Agia Kori II, is ideal for introduction to the relaxed but real canyoning with abseiling, water-sliding and jumbing for large adult groups and a canyoning paradise for families with smaller children. 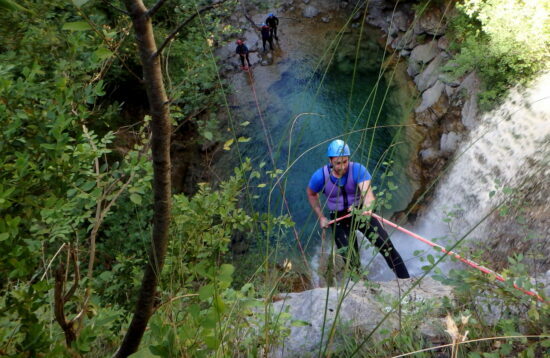 Canyoning in Orlias I section – Orlias canyon – Mt. Olympus. 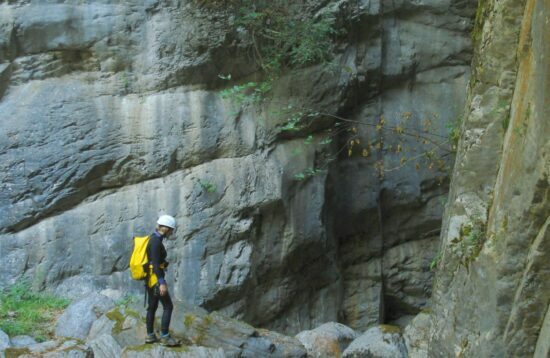 Canyoning in Enipeas I section – Enipeas canyon – Mt. Olympus.